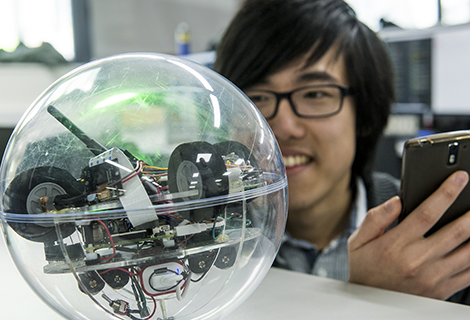 Southampton has an unrivalled reputation in Electronic Engineering and our graduates are employed worldwide in highly prestigious positions. They use the skills and knowledge they developed in Southampton to engineer the electronic signals that are present everywhere around us. 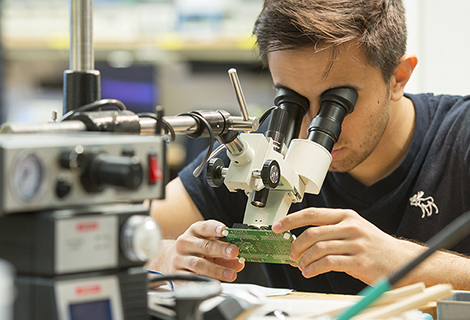 From cutting-edge electronics, computer processors and artificial intelligence, to nanoscale materials and communication techniques – our students have a hand in it all. Our labs, tutorials and modules use a variety of innovative teaching methods and assessment, including coursework, groupwork and exams. Here are some examples of what you'll be able to do. Our students enhance their practical skills building and using our Micro Arcana family of processing boards: Il Matto (8-bit Atmel microcontroller), Il Bagatto (Altera CPLD), La Papessa (Xilinx FPGA), L'Imperatrice (Freescale ARM9 applications processor). The Micro Arcana boards have been designed in-house to enhance student learning and include similar capabilities to Arduino and Raspberry Pi. 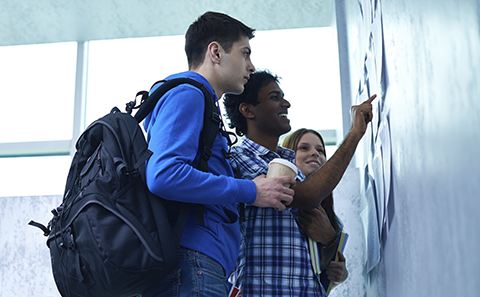 Once our students have built these boards, they are theirs to keep. They will use them as part of the taught programme and can use them in their personal projects. A project where the Micro Arcana boards are particularly useful is the system design exercise which our students complete near the end of their second year. Teams of six are given free reign to apply all of the skills, knowledge and understanding that they have learnt to solve a challenging problem. This involves designing, building, testing and demonstrating a complete electronic system, from scratch, in just three weeks! At the end of the exercise, the students produce videos and presentations to pitch their designs to a judge from industry, who awards prizes to the members of the most impressive team. Each year, we have a different problem specification for the project, which is not revealed to the students until the last minute. Recently, the objective was to build a portable video game system and another year the students built football-playing robots - the theme of each year's exercise is a closely guarded secret. 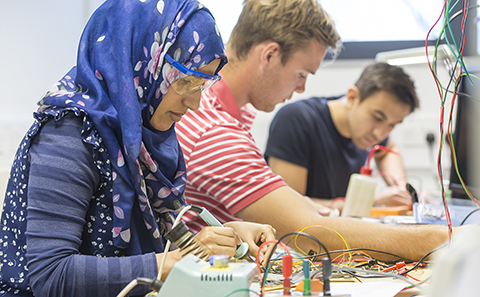 Within the ECS Electronic Engineering degree, there are a number of opportunities to specialise, within both 3 year bachelor degrees and 4 year undergraduate masters degrees. These programmes are also available with a Foundation Year. If you love maths, technology or science, try our week-long taster course in electronics and computer science. 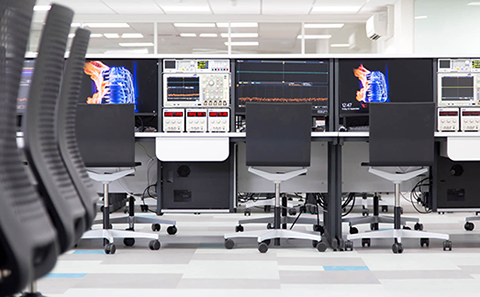 Electrical and electronic engineering students benefit from bespoke high tech benches with built in test equipment and dual high definition monitors. The facilities alone would make anyone want to come to Southampton but with the recent development of their innovation hub and inspiring lecturers, it has created an experience which makes its students some of the most desirable and employable in the world.